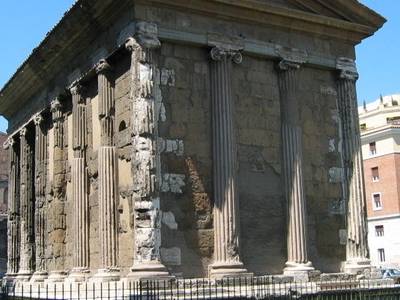 The Temple of Portunus (Italian: Tempio di Portuno) is an ancient building in Rome, Italy, the main temple dedicated to the god Portunus in the city. It is in the Ionic order and is still more familiar by its erroneous designation, the Temple of Fortuna Virilis ("manly fortune") given it by antiquaries. Located in the ancient Forum Boarium by the Tiber, during Antiquity the site overlooked the Port Tiberinus at a sharp bend in the river; from here, Portunus watched over cattle-barges as they entered the city from Ostia. Dating from the first century BC, the rectangular building consists of a tetrastyle portico and cella, raised on high podium reached by a flight of steps, which it retains. Like the Maison Carrée in Nîmes, it has a pronaos portico of four Ionic columns across and two columns deep. The columns of the portico are free-standing, while the five columns on the long sides and the four columns at the rear are engaged along the walls of the cella. This form is sometimes called pseudoperipteral, as distinct from a true peripteral temple like the Parthenon entirely surrounded by free-standing columns. It is built of tuff and travertine with a stucco surface. The temple owes its state of preservation from its being converted to use as a church in 872 and rededicated to Santa Maria Egyziaca (Saint Mary of Egypt). Its Ionic order has been much admired, drawn and engraved and copied since the 16th century (see illustration, right). The original coating of stucco over its tufa and travertine construction has been lost. The circular Temple of Hercules Victor is located south-east to the temple in the Forum Boarium. The 18th-century Temple of Harmony in Somerset, England is a folly based on the Temple of Portunus. Here's the our members favorite photos of "Ruins in Rome". 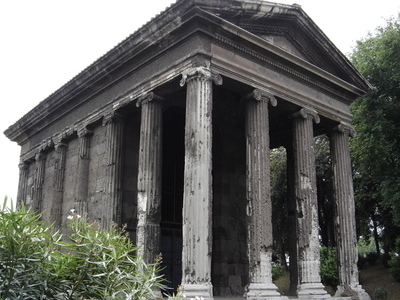 Upload your photo of Temple of Portunus!